November 18, 2017 is going to be a busy day. Not only is it Local Comic Shop Day, Justice League Day, and our monthly Sci-Fi Meetup, but we will be graced by the presence of Tugg, the real-life superhero! 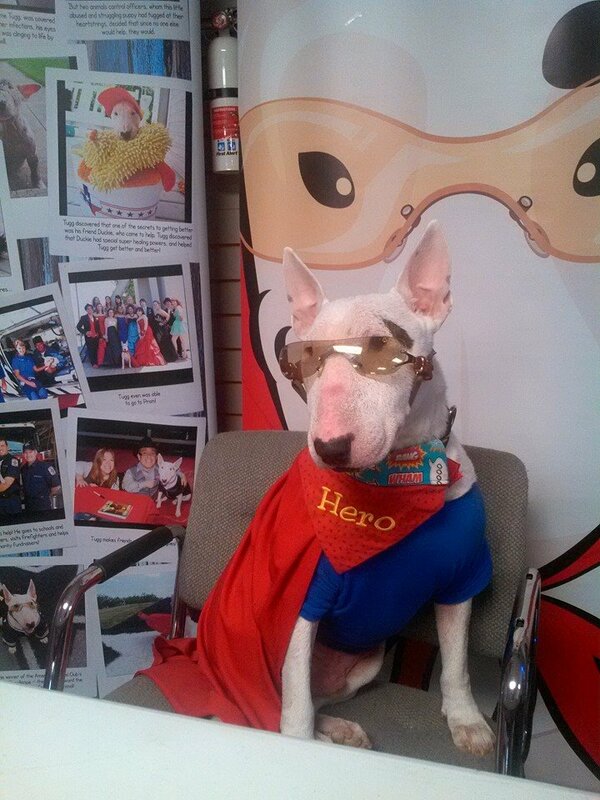 If you've never met Tugg, he is a most-lovable bull terrier. A rescue dog that was tossed aside, he found a human who gave him love and a home and nursed him back to health. It's a heart-breaking beginning that leads to a heart-warming future as Tugg becomes a superhero. Tugg's owner, Blake Ovard created a comic series that stars the lovable dog and uses it to highlight the plight of animals in need of rescue, bullying and many other social issues. With proceeds going to animal rescue, Blake is releasing Tugg #4, the completion of a four-part series. So join us Saturday November 18th from 1 to 4pm with Blake and Tugg! 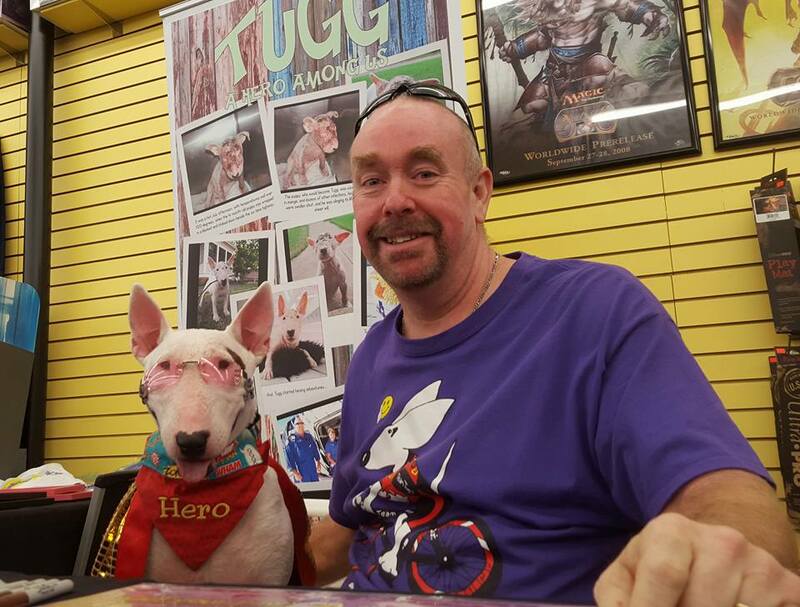 We will have plenty of comics and other items, so come in and get a pawtograph from Tugg - A Hero Among Us! The sun was setting on a typically hot and muggy July evening, just a couple of days after July 4th, in Fort Worth, Texas when the call came in to police dispatch — a badly burned puppy, that was still alive, was wrapped in a blanket and staked down beside a busy six-lane road. A single word, dog, was scrawled on a small sign attached to the stake that held the blanket and puppy in place. A police officer was dispatched and the on call animal control officer was contacted. The police officer arrived first on scene — and sat with the poor puppy for almost an hour before the animal control officer could arrive. The police officer said he could not believe what he saw — a small, male, bull terrier puppy, about four months old, which appeared to have been badly burned. The animal control officer arrived and carefully took the puppy and placed it in his truck, which he drove immediately to the animal shelter. The puppy was given food and water and made as comfortable as possible while waiting to see the shelter vet the next morning. The puppy was evaluated, and to the relief of many, was found to not have been burned. He had an extremely bad case of demodectic mange — and a host of other infections and ailments, both internal and external. He could not see because his eyes were swollen shut from the infections and scabs from open sores covered his head and upper body. The shelter staff put out calls to local rescue groups, including both breed specific and all breed rescues, and the staff tried to make sure the small bull terrier had what he needed. Everyone waited, hoping a rescue would come in, take and treat this puppy who couldn’t see those taking care of him, but who would inch his way to the front of the cage whenever he heard human voices close by. A couple of days went by, and a few of the rescues expressed an interest, but said they were full and couldn’t spare the room. Another said the procedures to treat the diseases and ailments would cost too much money, and with donations down, they couldn’t spare the expense. A few days turned into a week, and the shelter staff did the best they could for the pup. We, Tugg's mommy and daddy, are both animal control officers. We watched this small, frail puppy and did what we could, hoping a rescue would come forward to help him. We contacted every rescue we had contacts for, including the local breed specific bull terrier rescue, but none were willing to help this little pup. So, we decided that if the weekend came — well past the 72 hours hold at the shelter— and still no rescue would help, we would take this magical puppy home and care for him ourselves. He was slated for euthanasia on Monday. No rescue willing to help this poor pup was one of the sparks that would lead us into creating Tugg's Pink House of Wuff Rescue, Inc.
No one or rescue came forward by Sunday to help this dog, so we scheduled an appointment at an emergency vet, and took the 4-month-old bull terrier puppy to see what medications would be needed. We did not expect what the vet told us. After the exam, the vet said she had some bad news — she felt this puppy was too far gone and should probably be put down so that he wouldn’t suffer any more. During the week, a few of the officers and the vet tech at the shelter had tried to softly wash the areas around the pup’s eyes so that he could open them. He couldn’t open them much, but by Sunday he could open them a tiny amount. In that tiny sliver of his eyes being opened we could see the spark within — the spark that said this bull terrier wanted to live. We felt there was still a chance, and we said we couldn't put him down without trying. We called and set an appointment for as early as possible the next day at our normal vet. We carried in the weakened pup, and waited with baited breath while our vet did the examination. As he finished the exam our vet smiled, which is his normal demeanor, and told us that he thought the dog had a chance — maybe not much of one, but he had one. That was all we needed to hear. He said the fight would not be short, and it would not be easy. It would take a lot of time, medication, love, good nutrition and money, but it could possibly be done. There was no question what we would do. This little one showed the will to live and showed that he would fight for it. We would give him a chance. Before we even got home, we knew he would not be like any of our other dogs — we also own show Briards, a Sheltie and Border Collie — or any of our foster dogs. We knew he was coming home to stay. On the way home, we named him — Tugg, because he tugged at our heart strings. The first few days were touch and go with Tugg. He ate, drank and went out to do his business. And any time not spent doing that, he slept. Each morning we would wake up and hope he was still alive, and each afternoon when we got home we had the same hope. In addition to taking on Tugg, we were also in the middle of training two dogs for the Extreme Mutt Makeover — an event only 15 dog trainers are invited to participate in each year, and we were the only trainers who had two. Each of the dogs I was training had their own facebook pages as part of the program. We discussed making a page for Tugg as well, since a few of friends and family asked, almost daily, how he was doing. That’s when Tugg got his own facebook page. There were only a dozen or so of our friends and family following Tugg’s progress on his new facebook page the first days. His daily pupdates included a little about how he was doing with his treatments and a little about what he had gotten into that day, if anything. Each day was a new day for Tugg, and he saw the world through his newly opened eyes, in a way that was full of wonder and amazement. Like a child wrapped in a dog suit, he also discovered that while he was getting better in the real world, in Tugg’s world, he was also a super hero. Sometimes his adventures even take on a look like being in a comic book. Within a week, the number of followers had climbed to 100. By two weeks the number had almost doubled, and by a month Tugg’s page had almost 1,000 followers from all over the world. The number of fans increases daily as new fans discover the magic of this little bull terrier, and now, he is approaching 30,000 fans — worldwide. From South Africa to Israel, to Thailand to Europe and Australia, his fans log in daily to see how Tugg is doing and see what Tugg is doing. It doesn’t matter that they are in other time zones or half a world away. Tugg’s pupdates are full of hope and wuff — his word for love. People come to get inspired, uplifted, supported, motivated and accepted for who they truly are. Tugg's pupdates are all about positive energy, happiness, empowerment, turning negatives into positives and focusing on the can-do's in life. There is no obstacle Tugg can’t overcome, and he always tries to see the good in every situation. Sometimes you'll be moved to tears, others to laughter. 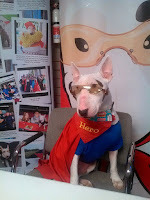 Tugg promotes kindness, charity, philanthropy, responsible pet ownership, wuff and social responsibility!